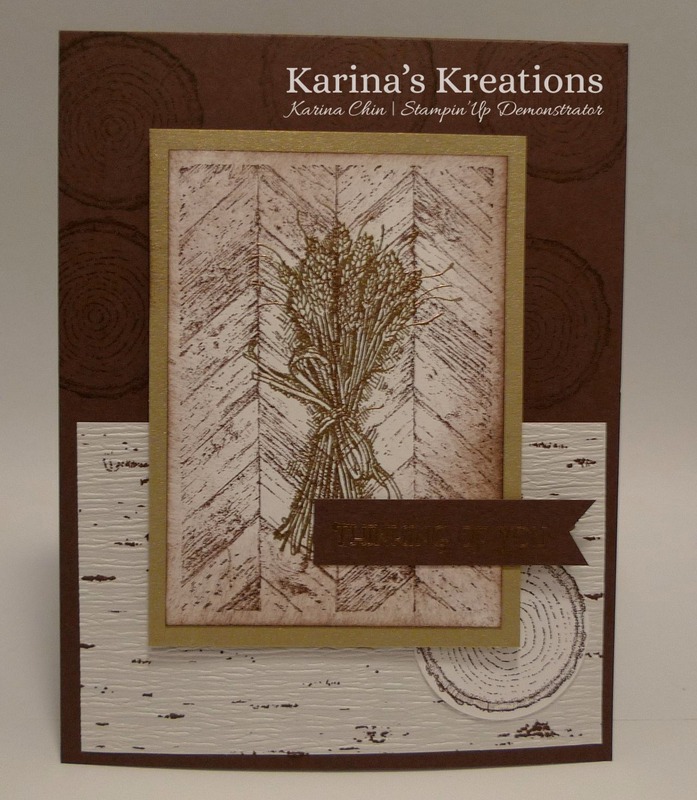 Karina's Kreations: Stampin'Up Truly Grateful! I still haven't finished my Halloween banner yet but I made this cute card for my swap tonight at coffee talk. Once a month I have my friends over to stamp and tonight we'll be making a Christmas project. It's a decorated box with 4 cards. I'll show you one the cards tomorrow. The starter kit has a special this month if you would like to start joining us. When you buy the starter kit for $125.00 you get $155.00 in free product plus you can choose a bonus kit for free. I would recommend the Canvas Banner Kit #133507 or the Thankful Tablescape Kit #133463. Click here to get your free stuff! My card is made with paper from the Thankful Tablescape Kit. I used the birch bark paper as Designer Series Paper. Isn't it pretty? I wanted a gold theme for my card so I used the Brushed Gold Card stock#102935 as a layer on my card. 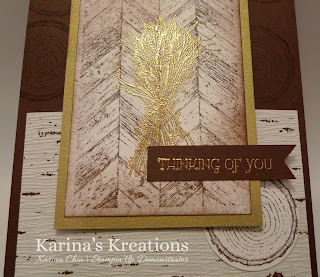 I stamped the Wheat image and greeting with Versamark ink and embossed them with Gold Embossing powder #109129. The two stamp sets are Gifts of Kindness #130444 and Truly Grateful#131733. I hope I have inspired you to stamp and I would love for you to join our group.